View of “Krüger&Pardeller: Homo Faber,” 2014. 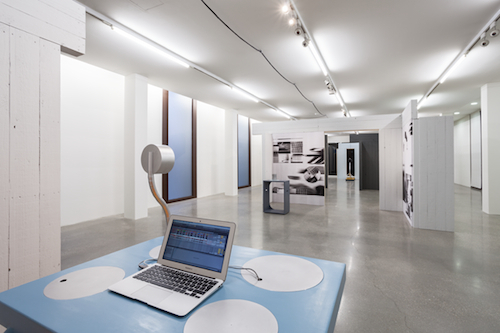 On a communicative collision course, the duo of Krüger&Pardeller—artists Doris Krüger and Walter Pardeller—allow not only different artistic fields of action but also different times and biographies as well as formal and material languages to crash into one another in their solo exhibition. In their installation titled Homo Faber, 2014, they juxtapose their own practice with the work of one of the most important Austrian sculptors of the twentieth century, Fritz Wotruba. The concept of “homo faber,” articulated by Hannah Arendt in The Human Condition as a question of that being who actively participates in his environment, thereby changing and shaping it, serves as a connecting thread between these two bodies of work. Central not only to Arendt’s theory but also to Krüger&Pardeller’s is the time and labor of artistic production. In this extensive installation a stage set displays their works, including a photographic wallpaper piece, within a system of partition walls, pedestals, platforms, and varied sightlines. Added to that are the sculptures of Wotruba, such as the bronze-cast Kleine stehende Figur (Small Standing Figure), 1961, in the interior space of the installation, or the bronze Sitzender (Seated Subject), 1946–47, in the exterior space. The individual elements of Homo Faber are connected on a conceptual level via Arendt and through an ephemeral soundscape that fills and permeates the space, amplifying the voice of Wotruba himself, who speaks about the idea of artistic production as a “moral principle” and as “resistance.” Wotruba’s archives happen to be housed in this venue, and Krüger&Pardeller discovered this sound document in the archive, had it digitized, and have embedded it as a point of departure for their own self-reflexive and critical sculptural praxis.